There are two photographs that hang on my office wall. Every day when I enter my office I look at them before starting my day. They are pictures of two old people. One is of a gentleman in a blue suit and other is a black-and-white image of a man with dreamy eyes and a white beard. It was a long time ago. I was young and bright, bold and idealistic. I was in the final year of my master’s course in computer science at the Indian Institute of Science [IISc] in Bangalore, then known as the Tata Institute. Life was full of fun and joy. I did not know what helplessness or injustice meant. It was probably the April of 1974. Bangalore was getting warm and red gulmohars were blooming at the IISc campus. I was the only girl in my postgraduate department and was staying at the ladies’ hostel. Other girls were pursuing research in different departments of science. I was looking forward to going abroad to complete a doctorate in computer science. I had been offered scholarships from universities in the US. I had not thought of taking up a job in India. After reading the notice I went fuming to my room. I decided to inform the topmost person in Telco’s management about the injustice the company was perpetrating. I got a postcard and started to write, but there was a problem: I did not know who headed Telco. I thought it must be one of the Tatas. I knew JRD Tata was the head of the Tata Group; I had seen his pictures in newspapers (actually, Sumant Moolgaokar was the company’s chairman then). I posted the letter and forgot about it. Less than 10 days later, I received a telegram stating that I had to appear for an interview at Telco’s Pune facility at the company’s expense. I was taken aback by the telegram. My hostel mates told me I should use the opportunity to go to Pune free of cost and buy them the famous Pune saris for cheap! I collected Rs 30 each from everyone who wanted a sari. When I look back, I feel like laughing at the reasons for my going, but back then they seemed good enough to make the trip. As directed, I went to Telco’s Pimpri office for the interview. There were six people on the panel and I realised then that this was serious business. “This is the girl who wrote to JRD,” I heard somebody whisper as soon as I entered the room. By then I knew for sure that I would not get the job. That realisation abolished all fear from my mind, so I was rather cool while the interview was being conducted. It was only after joining Telco that I realised who JRD was: the uncrowned king of Indian industry. Now I was scared, but I did not get to meet him till I was transferred to Bombay. One day I had to show some reports to Mr Moolgaokar, our chairman, who we all knew as SM. I was in his office on the first floor of Bombay House [the Tata headquarters] when, suddenly, JRD walked in. That was the first time I saw ‘appro JRD’. Appro means ‘our’ in Gujarati. That was the affectionate term by which people at Bombay House called him. I was feeling very nervous, remembering my postcard episode. SM introduced me nicely, “Jeh (that’s what his close associates called him), this young woman is an engineer and that too a postgraduate. She is the first woman to work on the Telco shop floor.” JRD looked at me. I was praying he would not ask me any questions about my interview (or the postcard that preceded it). Thankfully, he didn’t. Instead, he remarked. “It is nice that girls are getting into engineering in our country. By the way, what is your name?” “When I joined Telco I was Sudha Kulkarni, Sir,” I replied. “Now I am Sudha Murty.” He smiled that kindly smile and started a discussion with SM. As for me, I almost ran out of the room. I consider JRD a great man because, despite being an extremely busy person, he valued one postcard written by a young girl seeking justice. He must have received thousands of letters every day. He could have thrown mine away, but he didn’t do that. He respected the intentions of that unknown girl, who had neither influence nor money, and gave her an opportunity in his company. He did not merely give her a job; he changed her life and mindset forever. My love and respect for the House of Tata remains undiminished by the passage of time. I always looked up to JRD. I saw him as a role model for his simplicity, his generosity, his kindness and the care he took of his employees. Those blue eyes always reminded me of the sky; they had the same vastness and munificence. 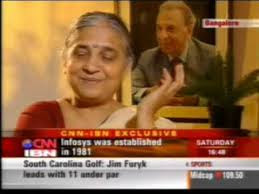 * Sudha Murty is the chairperson of the Infosys Foundation. She is involved in a number of social development initiatives and is also a widely published writer.